I wonder why people become emotional and start hating each other when sharing different views in discussing an issue of importance. I for one enjoy cordiality with everyone in the people’s movement and I am the champion of unity of purpose than any other thing. Across different ambitions in the party, there is non that can cause me to miss my meal because it is not necessary. What is necessary is to share the ideals of the future. There is no doubt that the foundation of our dreams as a nation and as a generation have been betrayed by folklore politicians whose test has gone sterile on the grounds of telling a story whose relevancy in the modern society and world is lost. 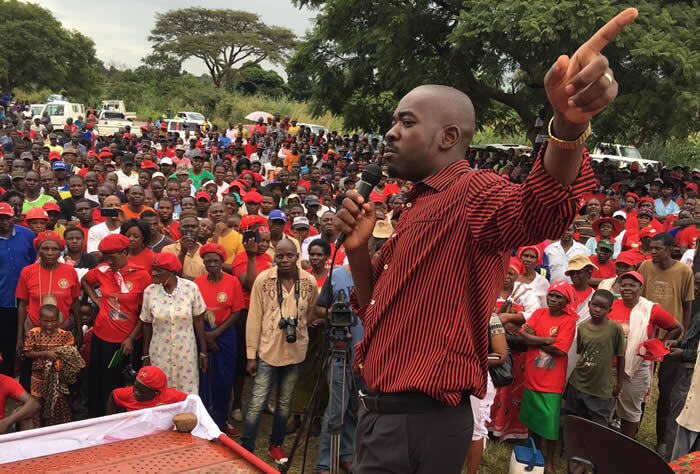 It is true that my generation together with that of Nelson Chamisa has been used as cheerleaders for too long a time without being given an opportunity to give solutions to national discourse and permission to seek Executive Authority to shape the future of our country. This generation has never been given the opportunity to excel but kept at a distant and destroyed in the process. It is the generation without the baggage of the past. That’s is why I am impressed by the passion being demonstrated by Nelson Chamisa in defying the adage that power must only be stored for the folklore politicians. The demystification is bringing to the fore generational conflict. It is such passion to liberate our generation from the tradition of being drawers of water and howers of wood which must be supported in full force. Chamisa being 40 and myself being 45 see the world from the same lens. The lens where we find it prudent that, now is the time to tussle for power. Power can not be obtained through blackmail or slander, but through marketing a vision and agenda setting. Story telling is the tradition of the past. Modern world is now moving with young leaders. Prosperous economies go for the young. Redundant States go with grandfathers as their leaders. Macron in France, Justin Trudeau of Canada and many countries. The modern world has become more scientific and sophisticated, the development which the old generation has failed to catch up with. It needs modern generation if our country is to prosper to catch up with the gap of development other countries are moving. There is no other time Zimbabwe has to make that statement to the world than now. It will be improper to assume that we condemn those who have seen the sun earlier than us. In my party, I need everyone to support this dream to come true. All our elder brothers should know that I for one, love them. It is their duty to support our dream as a generation. To our mothers and fathers, our dream is to make sure you witness the beauty of our country through supporting the dream of your children. To our brothers and sisters in colleges and universities we call upon you to render us your maximum support. To our brothers in the security services, this dream is the dream for you to develop into a well paid and equipped modern national asset. To all the farmers, land belongs to every Zimbabwean and you need maximum support to fully utilise the land. To our fathers and mothers in the Church, God should speak through you and pray for our country to be blessed with the dream of this generation. To all our brothers and sisters in the diaspora the opportunity to have your country properly shaped is through assisting this dream come true. We are missing you and we love you so much. The time is now.